What struck me was not so much the results, but the fact that the reported study began in 1979, the year I graduated from high school. Briefly, the article reported that Claire Parkinson, now a senior climate change scientist at NASA, began her groundbreaking Arctic sea ice study that year, which is accurately predicting what is happening in 2017. Published in 1979, Parkinson’s study found that a doubling of carbon dioxide in the atmosphere from preindustrial levels would cause the Arctic to become ice-free in late summer months, probably by the mid-21st century. Per climate scientists, the Arctic hasn’t been ice-free in more than 100,000 years. The 100,000-year figure struck me, also. It’s time (pardon the pun) to do so more very simple math. I am old, but not that old😊, at age 55. I have some great high school memories from the late 1970’s. 1979 was 38 years ago, though. 38 + 2017= 2055. In less than that time in only 33 years it will be the year 2050. Most people think that the year 2100, let alone the year 2050 is very far off. I beg to differ. The time to prevent “irreversible” damage or a “tipping point” with the climate is very short. Think about 33 divided by 100,000 = .0033. 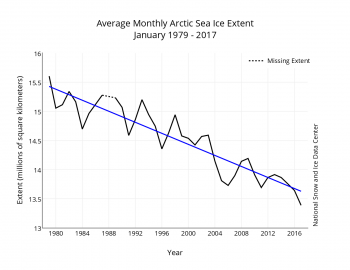 Thirty-three years or less is an extremely short timespan compared to how long it will take the North Pole to be free if ice in late summer. The concentration of CO2 currently in the atmosphere is around 405 parts per million. At the rate of the current business as usual rise, of 3 ppm per year and an initial pre-industrial level of 280 ppm, 560 ppm or a doubling of CO2 as mentioned in the article will occur around the year 2069, so humanity may have a little more time to get its act together on carbon pollution. The scary thought is that Claire Parkinson’s study is verifying , and the year 2069 is a scant 19 years past the year 2050…..just like 2017 is a scant 19 years past 1998. I will refer to when the Arctic is free of sea ice during the summer as a tipping point. Once the Arctic Sea is nearly totally exposed to sunlight, surrounding areas, such as Greenland, will be affected by the darker albedo of ice-free ocean producing much more rapid melt of glaciers and ice on land. The melt, in turn, will greatly increase the rate of sea level rise such that most coastal cities must adapt very fast. Some cities won’t survive what will probably happen after the year 2070. As you can see, the areal extent is at a record low…. No surprise here. In conclusion, climate change is happening now. Tipping points will probably occur in the mid- 21st century when most people reading this post will still be alive. Why is this important? Because anyone reading this and living past this decade may experience the dire consequences of climate change if the Arctic tipping point occurs. We will see how the conclusion of the February records “football” game works out on my next post.